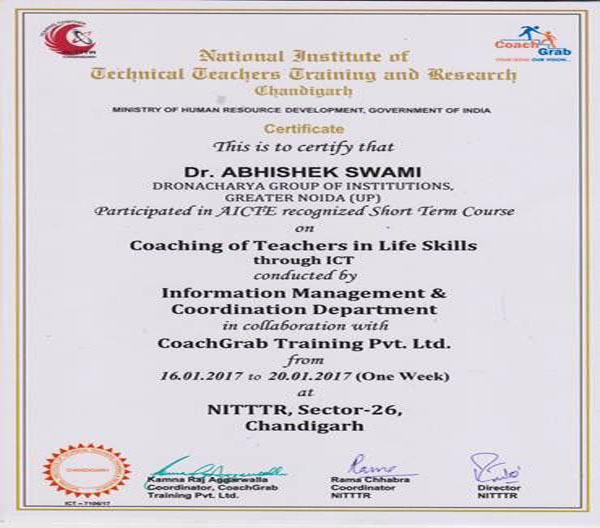 A Short Term Course on “Coaching of Teachers in Life Skills” was conducted by NITTTR, Chandigarh in collaboration with Coachgrab Training Private Limited during January 16 2017 to January 20 2017. 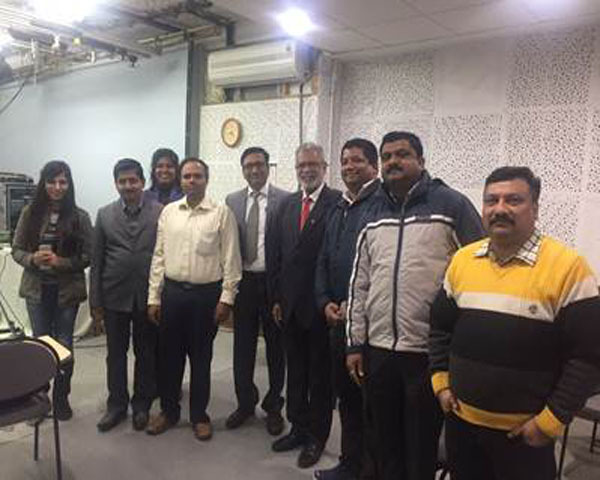 Dr. Abhishek Swami, Associate Professor, Departments of Applied Sciences and Humanities, Dronacharya Group of Institutions, Greater Noidaparticipated in the program. 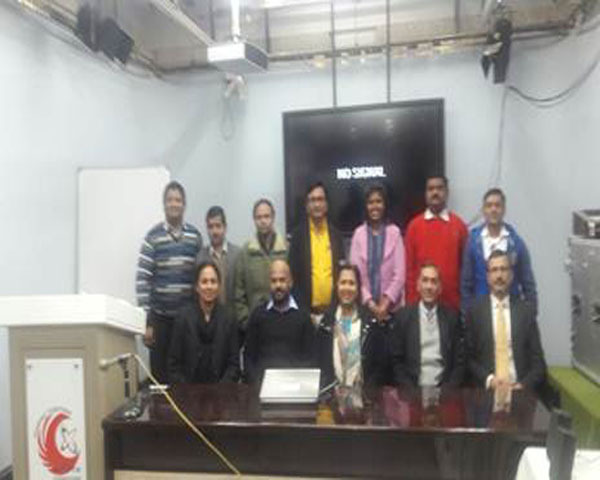 The program was delivered by eminent speakers of Coachgrab Training Private Limited. 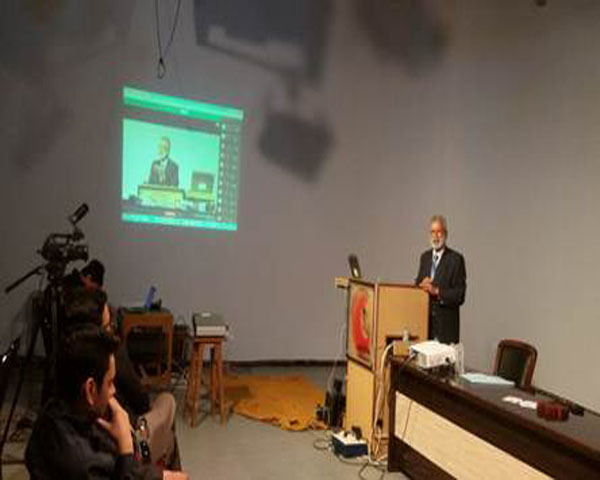 The objective of the program was to enhance the life skills of the teachers of the technical institutions so that they would be able to pass on the critical skills to their students as well, thereby, carving the students into smart and humane individuals who have the ability to overcome all the challenges. Sixteen remote centres were also connected with this program through ICT. 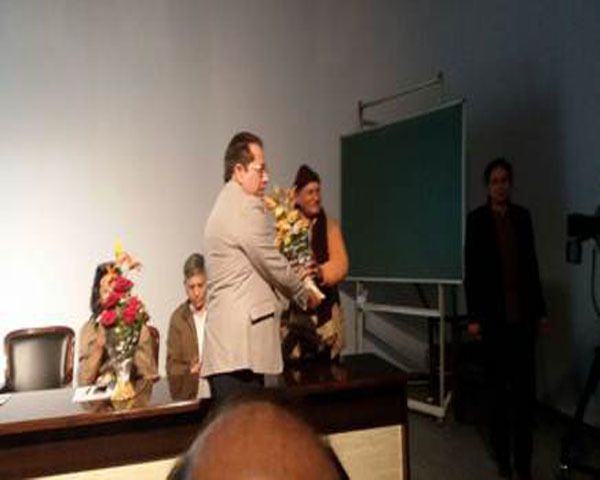 The session was inaugurated by Prof (Dr) M.P. Poonia - Director, NITTTR, Chandigarh with a key note address. 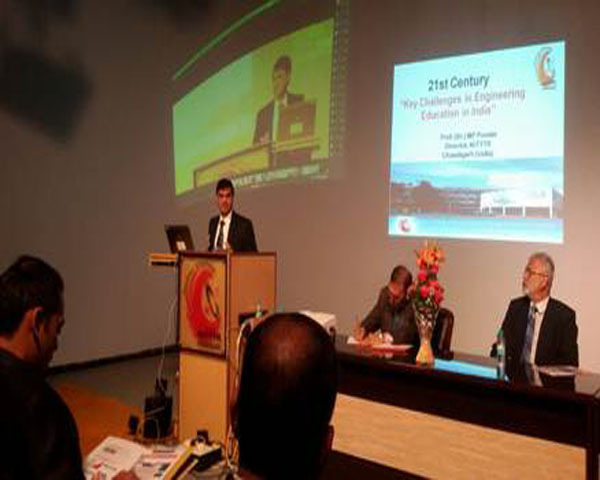 He gave a presentation on “Key Challenges in Engineering Education in India”. He identified the emerging issues and challenges in the field of Higher Education in India.He told that 80% students of India do not reach up to higher studies and this figure is much high in comparison to USA and China which is 40% and 60% respectively. He discussed the importance of having interactive session in a class. 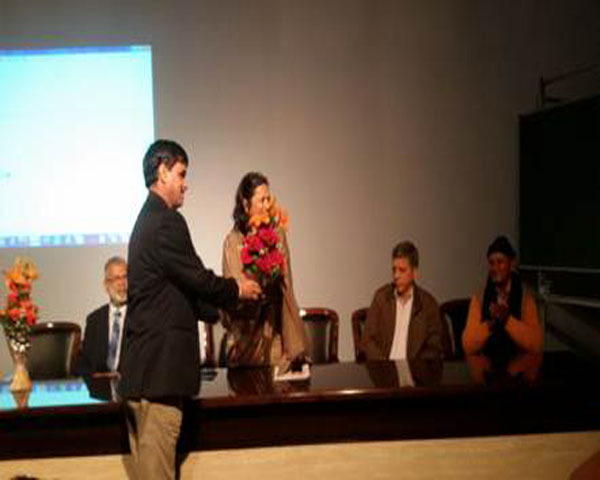 Prof. Poonia said that teachers should become role model for the students as well as for the society. The discussion with Dr Poonia was followed by a presentation on “Personality Development” by Mr. Alok Sood, Program - Director, Coach Grab. He discussed recognition of potential by students. He talked about the importance of wellness in life. He then gave tips for becoming more presentable. Mr Sood explained how students can expand their potential and plan the road map ahead to achieve their goals. Mr K.S. Sharma - Lead Coach, Coach Grab Private Limited discussed the need of time management, effective communication and delivery styles for the teachers. He gave tips for achieving the targets within available time and capacity. The session was initiated with a presentation by Ms Kamna Aggarwalla - Coordinator, Coach Grab Private Limited. She emphasized on qualities of a teacher as an individual. She discussed how a teacher can develop strong self - esteem. She conducted an activity in which the participants were asked to prepare a small write up on “My Success”. Then she conducted another activity which included a picture puzzle. The aim of the activity was to see things from student’s perspectives. The activity was followed by an exercise conducted by Mr. K.S. Sharma on goal setting for teacher and planning to achieve the goals. The session started with a presentation on “Self - esteem” by Mr. Raja Jayabalan - Coach, Coach Grab Private Limited.He discussed the importance of self - esteem for teachers and students. Mr. Raja said that self - esteem is made up of the thoughts, feelings, and opinions a person has about oneself. Mr. Raja conducted a practice session to improve teachers’ self - esteem. After tea break, a session on “Human Values” was conducted by Ms. Kamna Aggarwalla. She discussed the various aspects of human values such as human aspiration, self - realization, happiness and prosperity. Post Lunch session progressed with the presentation by Mr. K.S. Sharma. He discussed the various factors to be a passionate teacher. 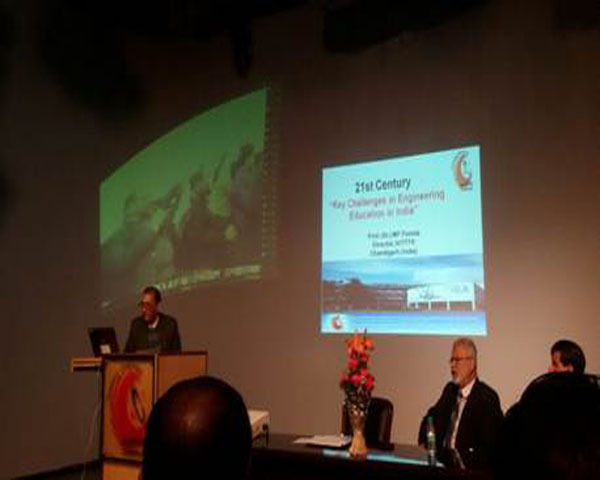 Mr. Sharma said that an effective teacher is the one who is creative and innovative. He suggested one doesn’t need to create everything from scratch, rather, one can modify one’s creation into something unique. He said that one can get inspiration from a huge number of sources such as books, Pinterest, YouTube, Facebook and blogs etc. The session concluded with a group exercise with a theme on being creative. The session started with presentation on “Service Leadership” by Mr. Raja Jayabalan-Coach, Coach Grab Private Limited. He initiated the session with a discussion on the various aspects of academic leadership, social leadership and professional leadership. Mr. Raja talked about conflict management. He then briefly described the change management process. He also talked about team building. Mr. Alok Soodgave a presentation on “Wellness”. He said that wellness is the optimum condition of soul, body and mind. In this regard he explained the iceberg model of wellness. He then conducted a goal setting exercise for wellness. Post lunch session, Mr. Raja Jayabalan discussed “Career Coaching”. He said that career coaching is a very important task for a teacher and through proper coaching a teacher can guide the pupils in selecting the best career option for them. Mr. Tanuj Saxena - Mentor, Coach Grab Private Limited talked on emotional intelligence and time management. Session concluded with a practice session on time management. The session initiated with a presentation on “Leadership and its Importance in Life“ by Mr. Pratyush Singh - Personnel Trainer Coach, Coach Garb Pvt. Ltd. In his presentation he discussed Entrepreneurship. He gave tips for creating the mind set for entrepreneurship. He said that entrepreneurship synthesizes information from across academic specialties and demands that practitioners work with a wide variety of people from different areas. He further elaborated on the practise of entrepreneurship. He stated that one cannot learn the practise unless one has experienced it. Mr Pratyush and his team conducted a number of programs in the country aiming to add an experiential dimension to Entrepreneurship and Innovation curriculum. 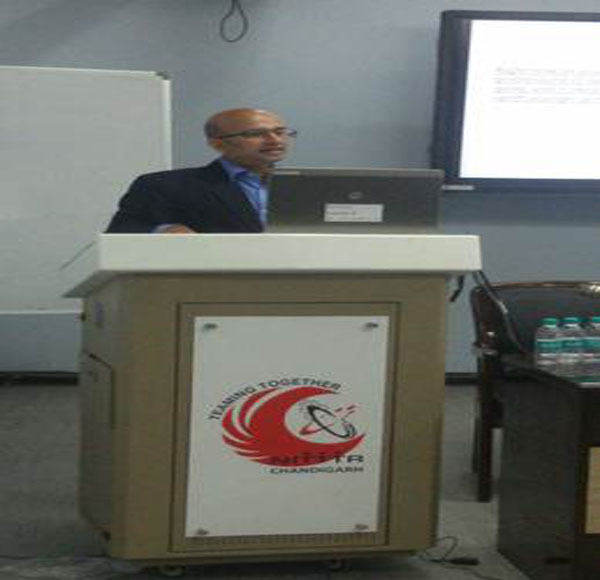 Mr Singh continued the presentation with a discussion on Critical Thinking, Lateral Thinking and Analytical Thinking. He said that critical thinking is often referred to as a critical analysis which is a clear, rational thinking involving critique. He defined it as an intellectually disciplined process of actively and skilfully conceptualizing, applying, analysing, synthesizing, and evaluating information gathered from, or generated by, observation, experience, reflection, reasoning, or communication, as a guide to belief and action. Mr. Singh then presented on a topic entitled “Life skills”. He defined life skills as abilities for adaptive and positive behaviour that enable humans to deal effectively with the demands and challenges of everyday life. Life skills is a set of human skills acquired via teaching or direct experience that are used to handle problems and questions commonly encountered in daily human life. 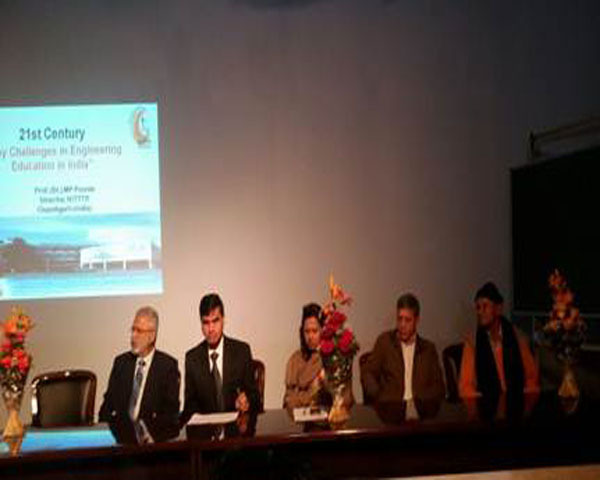 The presentation was followed by a Valedictory Session. Participants gave their feedback on the course content, quality and management of the program. At the end of the session certificates were distributed to the participants.